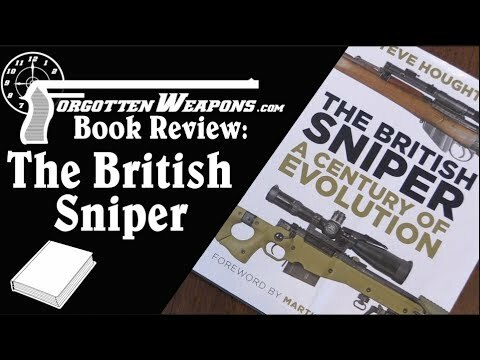 Steve Houghton’s newly released book “The British Sniper: A Century of Evolution” is an excellent reference on British sniper rifles, accessory equipment, and training from World War One through the present. Where Skennerton’s work ends in the 1980s, some of Houghton’s best information covers the Accuracy International L96A1 and Arctic Warfare rifles. The whole work is nicely illustrated in color, and provides a very digestible history of both rifles and optics, as well as supplementary gear like spotting scopes and sniper-specific clothing. The text is also dotted with first-hand anecdotes from snipers discussing the different rifles and their actual use. Houghton covers a variety of aspects of his subject matter. In addition to the development and use of the different rifles, he also discusses markings and practices that are quite useful in authenticating rifles – quite useful in a field where fakes are not uncommon. I would highly recommend a copy for anyone interested in sniping or British military small arms! Jerome Corsi REVEALED THE TRUTH On Roger Stone…Julian Assange!! Her Shady Past Comes Up, But Trump Is Corrupt! LOL!